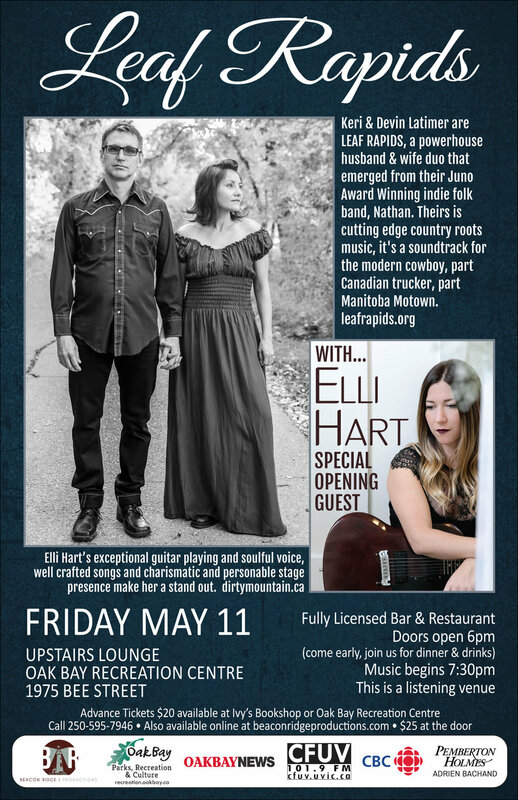 Fronted by husband & wife Keri & Devin Latimer, Leaf Rapids came out of their popular indie folk band, Nathan, which spent the early 2000’s signed to major label Nettwerk. Winning 2 Canadian Folk Music Awards and the 2008 Juno Award (Canadian Grammy) for Roots Traditional Album of the Year, Keri and Devin’s outstanding talents grabbed the attention of industry heavy weights, including Canadian roots music producer Steve Dawson. Dawson, a prodigious multi instrumentalist, was eager to work with Keri and Devin on their new project Leaf Rapids via his renowned record label Black Hen Music. As a five time Juno award-winning producer, Dawson brought his powerful talents on a wide variety of instruments, from pedal steel to electric guitar, crafting a full band sound for this duo that borders on indie roots. Opening the evening will be local roots singer / songwriter Elli Hart. Elli's exceptional guitar playing and soulful voice, well crafted songs and charismatic and personable stage presence make her a stand out.